Former Prime Minister Tony Blair has urged corporate leaders to take a stand on issues that align with their social purpose and warned social media giants to "take the initiative" on regulation. 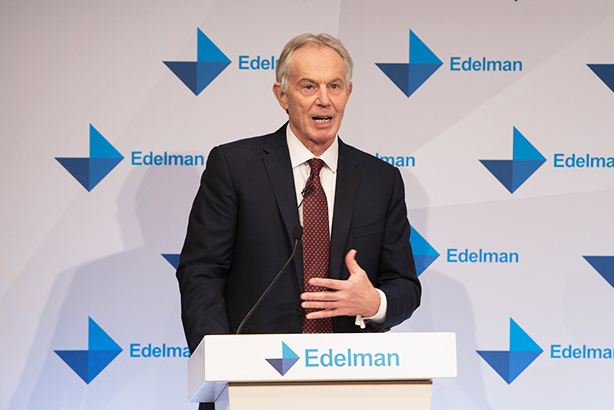 Blair made the remarks at the UK launch of the Edelman Trust Barometer, which found that 79 per cent of Britons expect CEOs to take the lead on change in the current absence of political leadership. It’s an insight that doesn’t surprise the former Labour leader, who presided over the UK government between 1997 and 2007 – a time when corporate CSR initiatives were in their infancy and often regarded as ‘greenwashing’. "I think CEOs now have a big role to play and there is a whole atmosphere around companies and corporate responsibility," he said. "Employees who come and work for you now – if they are good – want to know you’ve got the right values and you are trying to do the right thing. "Business has to do the same. Look at why social media companies are in such difficulty. Having grown up as these cool tech companies, they’ve suddenly become these global, powerful behemoths and people are saying – both the employees and their users – ‘you’ve got to exercise some social responsibility’." Blair supports businesses providing a voice and leadership that align with corporate interests provided "they do it carefully". Referring specifically to Brexit, he added: "If we get clarity before we leave, it will either be around a hard Brexit or a soft Brexit...at that point business has got to educate people about what those choices mean. Business need to spell out [that] these are the consequences." In the past two years, social media giants such as Facebook and Google have become embroiled in a litany of scandals about how they protect user data, police inappropriate content and allow political propaganda to disseminate on their platforms. Edelman UK CEO Ed Williams asked Blair whether he thought there needs to be stronger regulation of social media companies. "I think [regulation] will come and if I was one of those social media companies, I would be taking the initiative, rather than waiting for government to do it," Blair responded. "Considering the anxiety people have about the technology evolution, their risk is that people become anti-tech." Blair reserved pointed words for the role social media and conventional media played in polarising public opinion and dividing Britain. A ‘Disunited Kingdom’ was a key finding of the Edelman report, which found there has never been a greater divide between the ‘informed public’ and ‘mass public’. He said social media has a "very disorienting impact" on political leaders because they make decisions based on the minorities that scream the loudest on social media, while ignoring the concerns of the majority. "The first lesson you learn in political leadership is that those who shout loudest don’t necessarily deserve to be heard most. That’s not how social media works," he said. "In politics it is too frequently the medium of the loud mouth. Instant opinions unrelated to depth of knowledge and yet expressed with all the certainty of the true fanatic, accompanied by vicious denunciation of those who disagree. Conspiracy theories thrive, the centre ground gets squeezed, the extremes flourish and the choices for the public narrow." Exacerbating the problem is what Blair describes as "the conventional media". Because the media has become fragmented, with a commercial model upended by technology, "they increasingly believe that its only mode of survival is to take a constituency of people and keep them in a perpetual state of anger and grievance". This was having a polarising impact on both sides of the Atlantic, he argued, with pro-Trump versus anti-Trump and pro-Brexit pitted against anti-Brexit. "Social media then amplifies this tendency," he added. Tony Blair couldn't help but make a quip about Theresa May when talking the technology revolution. The usually optimistic leader, who now runs the Tony Blair Institute for Global Change, is pessimistic about the immediate future of the UK. He believes the British public will endure a period of populism before realising its limitations. He said two things can shorten the pain. The first is changing the way information is distributed and used in the "modern media age", and the second is to revitalise a "muscular centre ground" in politics – something he has been championing for a number of years. "One that is capable of accepting that behind the populist appeal, lie genuine issues which must be addressed," he explained. "For example, Brexit and the issue of immigration. It has to be one that is prepared to seek radical solutions in response to the desire for change, but which are based on evidence." Blair warned that time is ticking and although necessary, the focus on Brexit is a distraction from far greater social issues. Chief among these is the next technological revolution in which AI, robotics and other advances in technology will displace millions of British workers. "The real radical action that is required is in reforming systems, including government, changing work practices, vastly prioritising education and infrastructure. But all of these require difficult and unpopular political decisions and painstaking detail." 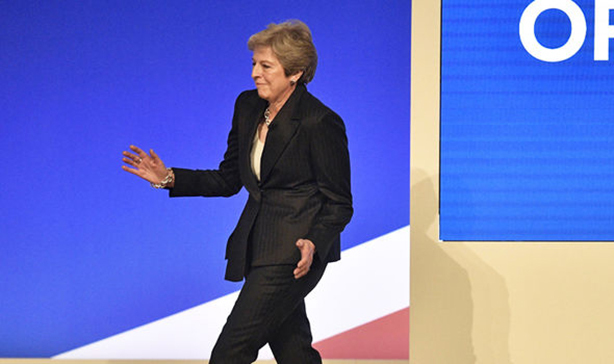 He jokingly quipped one job that will never be replaced by a robot is the ‘prime minister’, even if the current one – Theresa ‘Maybot’ May – occasionally tries to prove him wrong.